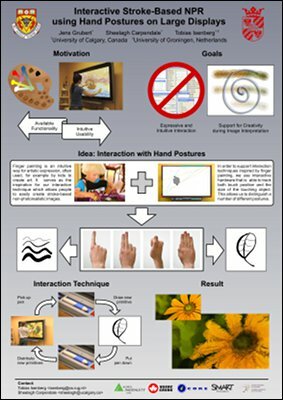 We explore the use of hand postures to interact with stroke-based rendering (SBR) on touch-sensitive large displays. In contrast to traditional WIMP interfaces, we allow people to directly engage with and influence a rendering. Our system allows the creation of new stroke primitives as well as provides mechanisms to distribute and then manipulate them on the canvas. We offer a set of natural mappings from hand postures to rendering parameterizations. The resulting system allows an intuitive exploration of SBR without the need for traditional desktop interfaces. Download the video as AVI-MPEG4 (12MB) or watch it on YouTube. Download the video as AVI-MPEG4 (5.7MB) or watch it on YouTube. You can download a demo of the Hand-Posture based Interactive Stroke-Based NPR (Win32, 9.1 MB) and try it out for yourself. To be fully functional, however, the demo requires Smart DViT hardware. 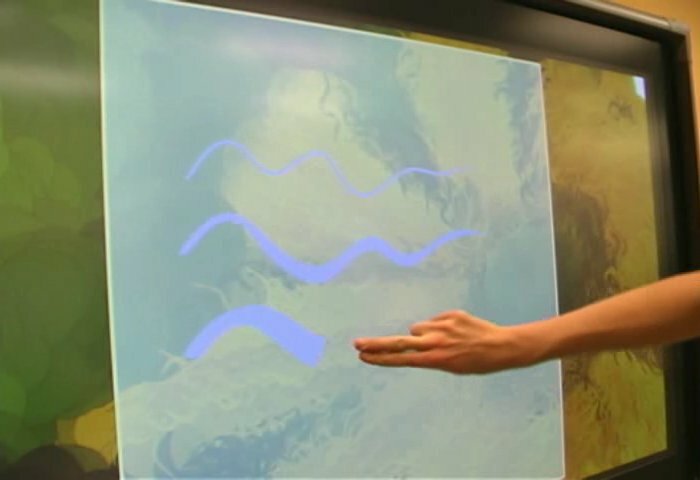 This technique is based on a buffer framework for supporting responsive interaction and was later used for interacting with glyph-based 2D vector data visualizations.